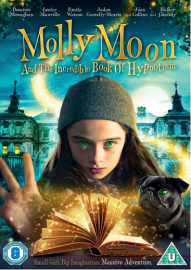 MOLLY MOON AND THE INCREDIBLE BOOK OF HYPNOTISM is an adaptation of the first book in the Molly Moon series by Georgia Byng. It tells the story of a young orphan who struggles through life alongside her friends (and enemies). Her life dramatically changes when one day she discovers an intriguing book in the local Briersville Library. The book, Hypnotism – An Ancient Art Explained, written by a mysterious master hypnotist – Dr Logan, starts her on an unstoppable journey of discovery and adventure. The movie stars Raffey Cassidy, Emily Watson, Dominic Monaghan, Joan Collins and Anne-Marie Duff. It was directed by Christopher N. Rowley. Chris and Georgia co-wrote the screenplay of the movie, working for a year and a half on it together. After this, two more writers, Tom Butterworth and Chris Hurford came on board. In this section you will find exclusive behind the scenes images, as well as stills from the movie and interviews with the cast. The movie is available will be in UK cinemas, on digital platforms and on DVD from Monday 5 December 2016, courtesy of Lionsgate Home Entertainment. It will be premiering at various film festivals around the world. More festivals will be announced soon, hopefully there will be one near you.